Nagasaki Prefecture (長崎県, Nagasaki-ken) is a prefecture in Japan on the island of Kyūshū. The capital city is Nagasaki. Nagasaki Prefecture was created by merging the western half of the old provinces of Hizen Province with the islands of Tsushima Province and Iki Province. Nagasaki is on the western coast of the island of Kyūshū. The southwest coastline faces the Sea of Japan and the East China Sea. 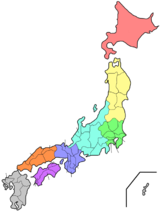 Saga Prefecture is on its eastern border. The prefecture has 505 islands with no people living on them. National Parks are established in about 18% of the total land area of the prefecture. Chiriku Hachiman-gū, Amanotanagoa jinja and Kaijin jinja are the chief Shinto shrines (ichinomiya) in the prefecture. ↑ Nussbaum, Louis-Frédéric. (2002). "Nagasaki prefecture" in Japan Encyclopedia, p. 683; Japan External Trade Organization (JETRO), Nagasaki Prefecture, Regional Information; retrieved 2012-4-6. ↑ Nussbaum, "Nagasaki" at p. 683. ↑ "Hachiman Shinkō," Encyclopedia of Shinto; retrieved 2012-2-3. ↑ "Nationwide List of Ichinomiya," p. 3; retrieved 2012-2-3.